Aikido, a modern martial art created by Morihei Ueshiba (1883 – 1969) is eminently appropriate for today’s society. Though a relatively recent martial art, Aikido’s roots run deep. Morihei Ueshiba (often referred to as O’Sensei – Venerable Teacher) trained in a variety of martial arts. What seemed to have the most influence was both his training in various styles of Jiujutsu and training with different Japanese weapons (Kenjutsu), particularly sword and spear. Drawing on both Jiujutsu and Kenjutsu, Aikido has both empty hand techniques as well as practice with weapons – boken (wooden sword), jo (short staff) and tanto (wooden knife). The movements are predominantly circular, using spiral movements to blend with the attacks. Aikido practice involves practice in both performing the technique (nage waza) and performing the attack and the resultant fall (ukemi waza). Aikido has an ethic that ensures that attackers are not harmed. 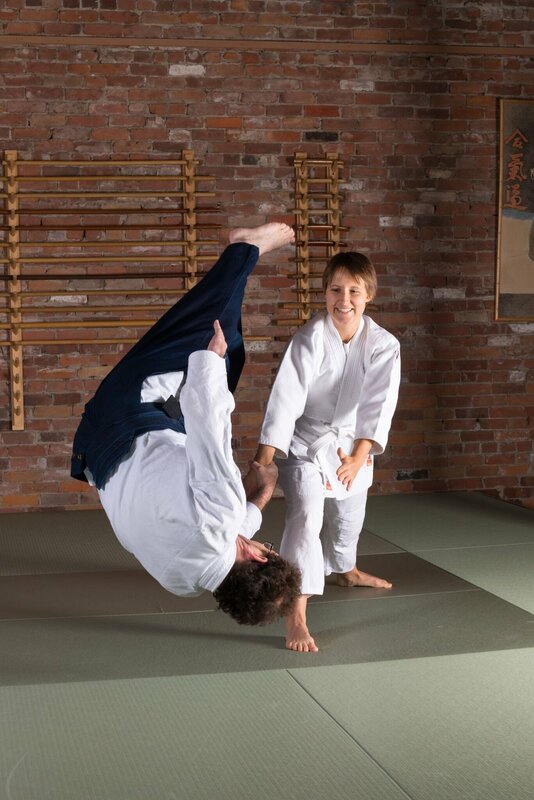 However, do not mistake this for being ineffective – Aikido is a martial art and above all, techniques must be effective. The name Aikido is composed of three Japanese words: ai, meaning harmony; ki, meaning spirit or energy; and do, meaning the path, system or way. Aikido is the way of the spirit of harmony. The flow of ki throughout our bodies is a core belief within Aikido. Harmonizing our own ki through movement, with our attacker’s ki and through that harmony linking with the universal ki, is what is meant by “the spirit of harmony”. O’Senei had a much larger view of the world and saw Aikido to be more than just martial technique or a martial art. Rather he saw Aikido as a way of joining the peoples of the world together in peace. “The true martial art is the one that defeats an enemy without sacrificing a single man; attain victory by placing yourself always in a safe and unassailable position.